Dramatically situated on a high bluff overlooking the Atlantic Ocean, the design of this home maximizes the ocean views while providing the homeowners with a sense of serenity and relaxation as befitting a beach house. 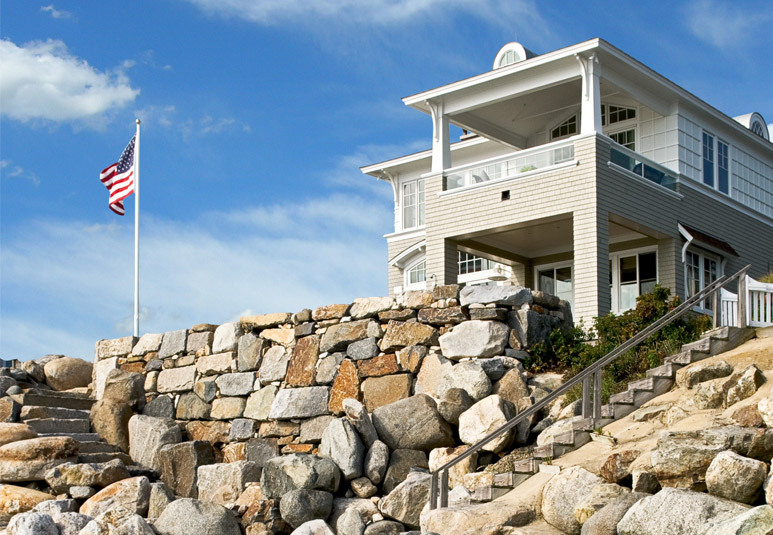 Stairs leading to the home from the sand are invisible as they are “secreted” away behind a seawall, ensuring the owners’ privacy. 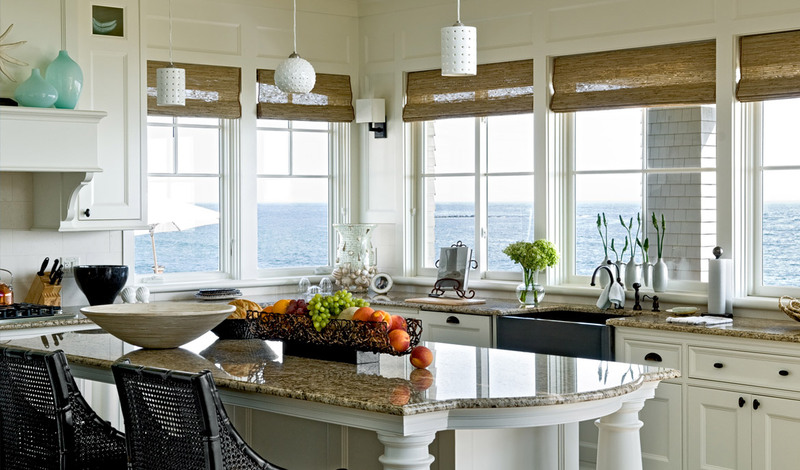 The homeowners’ wanted to design a home that would take advantage of what the site had to offer, including the amazing ocean views. It was important to them that the home reflect their desire for casual beachfront elegance which dictated that the architect create a meticulously detailed interior and exterior that evoked this sense of casual elegance and is a reflection of the location and the homeowners’ lifestyle. The site’s geometric proportions (180′ long by 50′ wide) imposed significant restrictions on the design components of the building’s architecture. 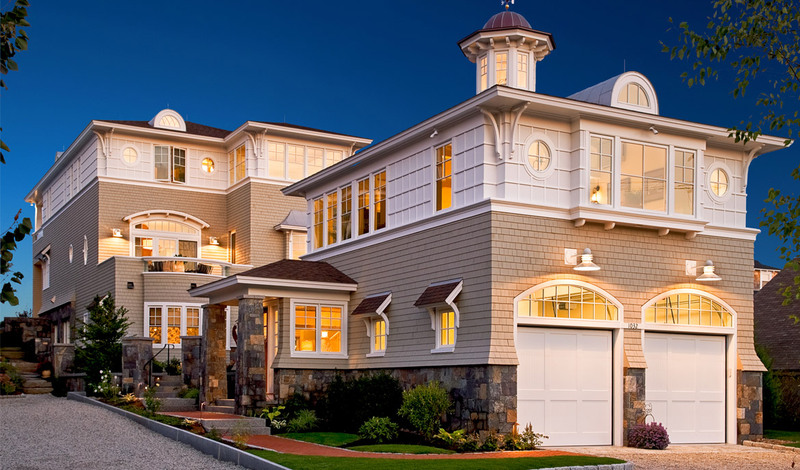 The client was willing to position the garage as a separate structure close to the street. The garage, the breezeway connector and the main house are positioned to form a landscaped courtyard. The courtyard acts a spatial and emotional transition from the heavily traveled and fast pace of the access road to a more tranquil exterior space leading to the main entrance of the house. Of paramount importance was to construct a home that was absolutely watertight and as maintenance-free as possible. The entire design team worked to maximize this goal. The only wood used on the exterior was cedar shingles on the side wall. 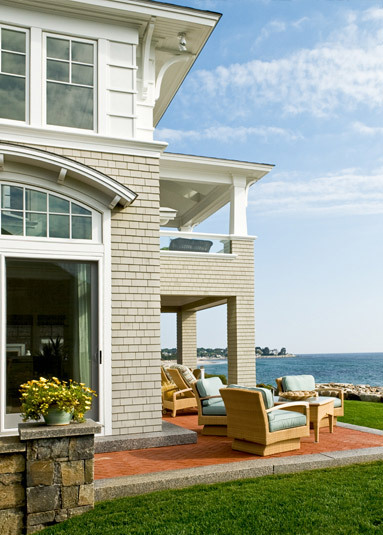 All other trim was made from synthetic “Aztek” material that won’t degrade when faced with the harshness of the New England seacoast environment. The top one third of the building was covered with a synthetic stucco material that does not have any joints where wind-driven water could penetrate.